Product information "ghd Platinum Electric Pink Styler & Bag"
The revolutionary ghd Platinum Styler has a new electric pink look as it works in collaboration with Breast Cancer Awareness. This award winning styler features the ghd patented tri-zone technology to achieve the best styling results, using the optimum heat that is safer for your hair. It has been proven that the Platinum Styler increases shine in the hair and reduces hair breakages by up to 50%, you so end up with healthier looking hair. The Platinum Styler is perfect for any hair length or hair type, due to the unique wishbone hinge holding the floating plates, giving you full control over styling your hair. 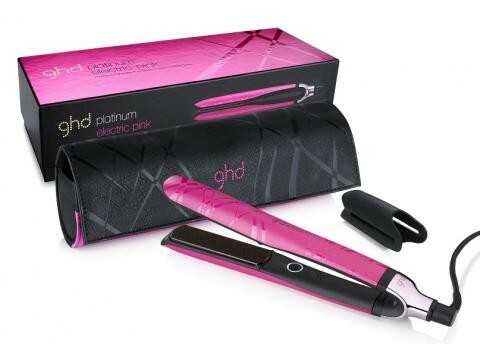 Related links to "ghd Platinum Electric Pink Styler & Bag"
Customer evaluation for "ghd Platinum Electric Pink Styler & Bag"